Can the Pies go one better in 2019? You would've been hard pressed to find anybody in football who could have imagined Collingwood featuring on the last weekend of September after being smacked by the Hawks in Round 1 last year. The Pies were two minutes away from a fairytale premiership in 2018, however, Nathan Buckley's men will once again feature prominently, at least in SuperCoach land. Champion Data rank Collingwood's list as having 14 players rated above average or elite in 2019; that's more than half of the Magpies' best 22 when fit and available. The Pies have two players ranked No.1 in their position across the AFL; the obvious being Brodie Grundy and the second being the not-so-obvious Jack Crisp who is ranked No.1 for all general defenders in the competition. The Pies also welcomed back former Premiership star and Copeland Trophy winner Dayne Beams into the fold during the trade period; he provides the Pies with yet another layer of class. Combined with a midfield of Scott Pendlebury, Steele Sidebottom, Taylor Adams, Adam Treloar, as well as emerging pair Tom Phillips and Brayden Sier, it's no wonder why the Pies are the No.1 ranked disposal team in the competition. 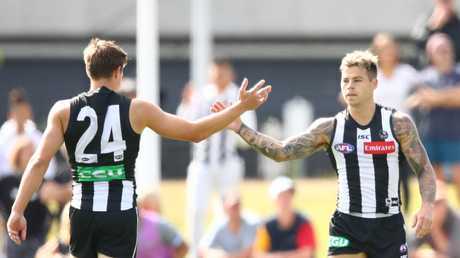 According to track watchers, injured trio Darcy Moore, Jamie Elliott and Ben Reid have made every post a winner this summer, with Moore and Elliott certain best-22 players and virtual recruits in 2019. Meanwhile, draftee Isaac Quaynor has looked electric off half-back since his arrival and could debut in Round 1. The likes of Jeremy Howe, Adam Treloar, Dayne Beams, Taylor Adams, Steele Sidebottom, and Jordan De Goey were highly-owned players in 2018, and we're expecting more of the same this year. If not for Max Gawn, Grundy would have been the runaway best-performed ruckman last season. Grundy is a true 'follower' in that he seems to bob up all over the ground - his ability to run with the ball, kick it accurately, clunk it cleanly, and put it down the throat of his plethora of midfielders while playing an average of over 106 minutes per game sets him apart as a unique player. He won't be a unique SuperCoach selection though; many players won't think twice at committing over $700,000 of their $10 million salary cap on the Magpies' ruckman, and they'll be rewarded with consistent performances as a result. In selecting Grundy, you're essentially picking up a ninth midfielder. THE VETERAN: SCOTT PENDLEBURY | $562,000 | MID | 103.5 avg. It's a sign of the times when Scott Pendlebury's numbers dip. 2018 was the changing of the guard at the Pies, as Collingwood's captain registered his fewest disposals since 2010, his fewest SuperCoach points since 2007, and his fewest score involvements since 2006. So what does that mean for SuperCoach? Pendlebury is as reliable as they come, and he still managed to bust out a triple-digit average in 2018, but it's a significant drop from the lofty heights of the 120-plus points he was regularly known for. Pendlebury's role has slightly changed with significant improvement from his midfield cohort. No longer do the Pies heavily rely on the smooth-moving midfielder to get things going, nor do they look to him in the clutch moments like they once used to. It's just as likely that as the Pies look to account for a missed opportunity in last year's Grand Final, a change of scenery to behind the ball or even a station up forward for the Collingwood captain wouldn't be out of the question. It might not be the year to start Pendlebury as many have in seasons past. But his talent and ceiling are unquestionable. More of an upgrade option at this stage, but worth keeping tabs on during the JLT to get an idea on how Nathan Buckley might deploy him in 2019. THE ROOKIE: ISAAC QUAYNOR | $153,300 | DEF | 90 TAC Cup avg. A clone of the Bulldogs' Jason Johannisen if we've ever seen one, the impressive Pies' Academy selection has hit the ground running since being taken at No. 13 in last year's national draft. 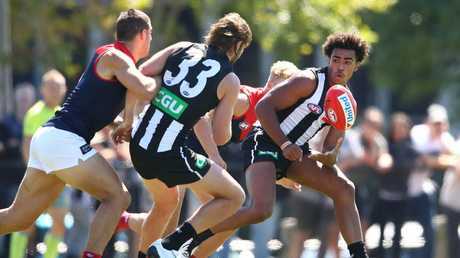 Boasting the body and maturity of a fourth or fifth-year player, track watchers at Collingwood have raved about his clean ball use, speed, and confidence on the attack from the backline. It's a tough team to crack, but Collingwood's clear lack of rebounding speed and class will allow 'IQ' to pledge his case for a Round 1 birth. A bit like Jaidyn Stephenson's situation last year, we wouldn't be surprised if this guy played every game. Quaynor was named one of Collingwood's best in a recent match simulation hit-out at Olympic Park. Keep a close watch, but the only reason you wouldn't pick him is job security reasons. THE BREAKOUT CONTENDER: BRAYDEN SIER | $435,000 | MID | 80.1 avg. Sier finished his 2018 season with a bang, becoming a vital player within the Magpies centre square combination as they powered their way to the grand final. While he only averaged a solid score in his nine home and away games, a score of 119 against the Lions in Round 21 was a glimpse of things to come. Sier's ability to impact the play in minimal game time bodes well for his 2019 output. Last season, Sier was only on the ground for a tick over 75% of game time. Boasting similar numbers to Patrick Cripps and Josh Kennedy at the same age, the boy they call 'The Bear' will feature heavily at the stoppages for the Pies, despite the return of Dayne Beams. Expect Sier's average SuperCoach score per round to soar. But at this price, it would take a confident SuperCoach coach to back him. Jamie Elliott of the Magpies is congratulated by Josh Thomas of the Magpies after kicking a goal during the AFL Practice Match between Collingwood and Melbourne at Olympic Park Oval. Heavily discounted after not playing a game in 2018, at his best Jamie 'Billy' Elliott is one of the most dynamic and damaging forwards in the competition. With a leap like a flea off a wet dog, 'Billy' looked dangerous in Collingwood's recent scratch match against the Dees last Friday, slotting two goals, taking a handful of marks and presenting well up on a high half-forward flank. He's one of Collingwood's best when he's up and going, and if named Round 1 could be a solid selection, if not a unique one. While a chequered injury history will be off-putting to some, there's value to be had if his body holds up. Certainly worth pursuing in Draft formats too. THE VALUE PICK: DARCY MOORE | $233,300 | DEF / FWD | 49.0 avg. Even Collingwood fans would need to be brave to pick Darcy Moore in SuperCoach after repetitive hamstring setbacks last year. However, the longer summer has gone on, the hotter Moore's hype has become. He's been given the responsibility for kick-outs this year, which will bode extremely well for his scoring projection with the new play-on rule from a kick-in. Moore's intercept marking ranks elite and his field kicking is within the same vicinity. He's firmly in Collingwood's best 22 and his added dual position availability is another reason to start him. But while he's priced favourably, as always with key position prospects, you'll need to throw caution to the wind and set your SuperCoach expectations accordingly. You'd be selecting Moore for a cash grab, however, if he doesn't work out there will be a plethora of downgrade options to choose from. The Pies will be one of the most SuperCoach relevant teams in 2019, with the likes of Adam Treloar, Taylor Adams, Steele Sidebottom and Dayne Beams part of an illustrious on-ball brigade who know how to maximise their scoring output in SuperCoach thanks to their high-possession game. Throw in gun forward Jordan De Goey and Top 10 SuperCoach defenders in Jack Crisp and Jeremy Howe and the Pies have an array of options for SuperCoaches to choose from this year in both Classic and Draft formats.